This is a great opportunity to get night diving experience as Wavebreak Island is calm and protected as well as reasonably shallow with depth between 4m and 12m. It is only a 10min boat ride away from Runaway Bay Marina. There is the unique opportunity that we may dive the Scottish Prince Shipwreck instead provided the ocean is super flat (captains call). Either way, both sites are shallow and suitable for beginners. 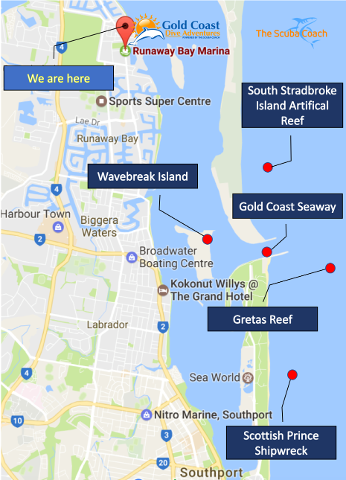 This man-made island within the Gold Coast Seaway offers protection from the ocean swells and shallow depth which make it ideal for learn to dive courses and introductory diving. The northern rock wall offers huge amounts of small fish which are used to being fed by the various dive operators, visiting the island everyday. The site is tidal and preferably dived at high tide. The depth ranges from 0m to 12m with an average of 4m hence ideal for unexperienced night divers. The wreck lies in 12m of water and is easy to navigate. It is almost impossible to get lost. The fish life is simply amazing. 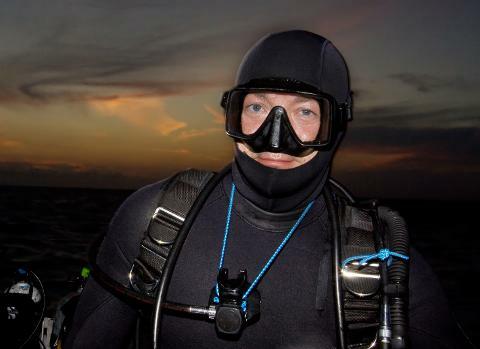 As mentioned to visit this site, we need super calm surface conditions in order to safely cross the bar at nigh time so we will only decide on this dive short before we go out hence we call it the Scottish Prince Gamble ;-). You may get to dive there or at Wave Break Island. Our vessel is a fast custom built 6m rigid inflatable with aluminium hull. The boat is fully set up for diving with tank rack, ladder and a shade canopy. Further features include an audio system and all legally required safety equipment. Our top speed is 40knots with a cruising speed of 25 knots depending on wave height. The trip departs from Runaway Bay Marina. Your confirmation and reminder emails include a map and directions.